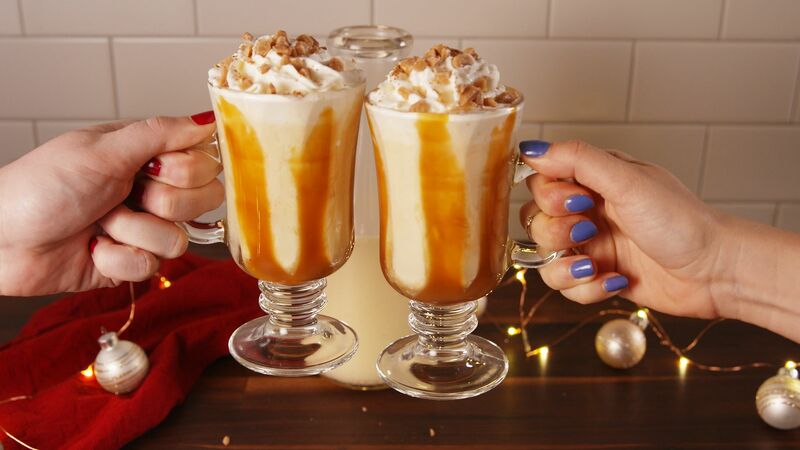 Tis the Season for Holiday Beverages! While any time of the year is suitable for having a glass of wine or cocktail, it seems that during the holidays we tend to go for the more unique and seasonal alcoholic beverages. Between Thanksgiving, Christmas, and the celebration of the New Year we gather yearly in the company of our friends and family for celebrations of food and drink. The typical drinks of choice are some standbys such as a well spiced holiday eggnog, mulled wine, and hot buttered rum. What better way to entertain and impress those that we care for than with a few unique and delicious variations. If the idea of creating and serving these drinks during the hustle and bustle of social mingling, and preparing and serving food seems overwhelming, then delegate someone to be the bartender. There won’t be a shortage of volunteers for the job. Some find that whipping up alcoholic concoctions is a little more interesting than stuffing a turkey. While traditional eggnog is made from milk, sugar, and raw eggs with a splash of either rum, brandy, or bourbon, there are many variations that can be added to spice things up a little. Want to surprise your guests with a special dessert that has a secret kick? Mix custard with the standard eggnog alcohol of choice and chill overnight. Serve in dessert dishes and top with whipped cream. Want another twist? Consider using ice cream instead of the custard! There is even an eggnog for beer lovers. Stout eggnog is a rich and unique drink that consists of eggs, milk, stout beer, dark rum, sugar, heavy cream, and a garnish of whipped cream along with chocolate shavings. While this beverage may not be for everyone, it will impress those that have a taste for a good beer. If wine is more your thing there are many ways to spruce up and enhance a typical glass of wine. A Campari mint spritz consists of Campari, cranberry juice, sparkling wine such as prosecco or cava, and fresh mint leaves. Served over ice, this drink is not only refreshing but also aesthetically pleasing to the eye with its traditional red and green Christmas colors. If you are unfamiliar with this particular type of wine, don’t fret for you can easily find a good wine sale. This is the time of year that many retailers offer various liquors and alcoholic beverages to try at reduced prices during their seasonal sale. If you enjoy a little fizz in your drink, then a glass of champagne may be the way to go. Bring the two delicious worlds of champagne and punch together and you will end up with fun in a glass. Mix together some triple sec, brandy, a raspberry flavored liquor, unsweetened pineapple juice, ginger ale, your favorite champagne, and some fresh raspberries. Throw all of the ingredients into a large punch bowl and toss in the raspberries. Guests can easily serve themselves while you enjoy your evening.